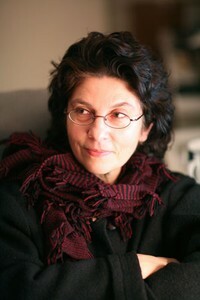 Agnieszka Taborska (b. 1961) is a writer, art historian, and translator of Philippe Soupault, Roland Topor, Gisèle Prassinos and Spalding Gray. Since 1988, she has lived between Warsaw, Poland and Providence, RI, where she teaches the history of French Surrealism at the Rhode Island School of Design. Her most highly acclaimed book is The Dreaming Life of Leonora de la Cruz (tr. Danusia Stok, New York: Midmarch Arts Press, 2007), published in Poland, France and the United States, illustrated with 35 collages by the New York based artist, Selena Kimball. It is an apocryphal story about an eighteenth-century Spanish nun "discovered" by the French Surrealists who made her their patron saint. In this book, brought to the stage by the Parisian theatre "Miettes de spectacles," all the typical features of Taborska's style are present: irony, imagination, passion for language play, dark humor, and erudition for which the history of Surrealism has no secrets. Taborska developed the Surrealist thread in her collection of essays Conspirators of Imagination: Surrealism in which she described the major themes and obsessions of the artists and writers belonging to the movement from a fresh perspective. The essays are especially interesting thanks to the fact that the author met some of these important historical figures. Taborska's fairy tales - published in Poland, Germany, Japan and Korea and classified by their German publisher as suitable for audiences from five to a hundred years old - have received awards from the German Academy of Children's Literature and have inspired animated films (awarded in turn at international film festivals). The collection of short stories, The Whale or Objective Chance (Wieloryb, czyli przypadek obiektywny, Warsaw: Czarne, 2010) - considered for The Best European Fiction series 2013 - relates the author's adventures as she travels the world. It does not simply describe various places, but captures the coincidences, absurdities, and barely perceptible rules hidden behind the marvelous surprises of everyday reality. Taborska's most recent book, The Unfinished Life of Phoebe Hicks, is inspired by the Victorian "flirtation" with the Beyond and by the unique aura of New England colonial towns. Deep knowledge of the history of spiritualism, merging with the writer's penchant for the oneiric and surreal, contributes to the creation of a poetic and intriguing story. It is her second collaboration with Kimball whose collages, using scraps of photographs taken during actual séances, create a parallel narration.